dictates the predator in any food chain. 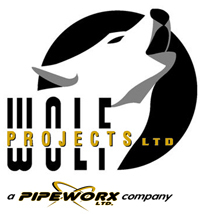 Responding to customer needs and market dynamics since our inception in 1997, Wolf Projects has grown to become a full service mechanical and pipeline contractor with management dedicated to providing top quality product and professionalism on variety of construction projects including compressor installs, pipelines and heavy hauling. It is our company's mission to be recognized as a leader in providing oil-field services through continuous improvement in all operations, with emphasis on training and educating employees in job safety and customer focus. We are proud to have experienced rapid growth as a result of a solid reputation built around the referrals of numerous satisfied customers,and look forward to a dynamic future that will see us take the lead in providing a broad range of services for the industry. On all projects, regardless of size of scope, customer service is the cornerstone of our business. Our direct and assertive approach to every project we undertake ensures the highest quality of work, on time and on budget. We are supported by a hard-working group of oilfield professionals who understand the importance of meeting our customer's needs and a management team that is just as likely to be found in the field as they are in their offices. It is this singular focus that makes Wolf Projects a leader of the patch, consistently meeting and exceeding our client's expectations.